Parts & Power are the Caribbean distributors for Dometic Marine refrigeration systems, products and spare parts. 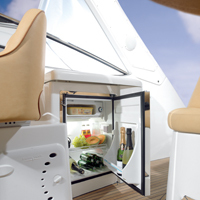 Whether you need a top-loaded fridge to fit a cupboard or a compact built-in fridges to match the rest of the galley, Dometic has a solution. Where height and width is limited, there are models to make optimum use of the available space, while perfectly matching the design of the interior. Where standard units don't fit, tailor made fridge space must be provided - an easy task with these ColdMachine cooling units. Supplied with pre-charged refrigerant and self-sealing valve couplings, they are fine for do-it-yourself installation. Three different series are available to cater to all applications. The ColdMachine cooling units work with power-regulated Danfoss BDF compressors. They are powerful, economical and superbly quiet in operation, tilt-insensitive and ready for connection to 12/24 volts DC. Each series comes with complementary evaporators specifically designed to match the performance of the compressor fitted. Dometic offers a large and well-proven range of portable boxes for cooling and/or freezing to ease your mobile lifestyle. Choose from thermoelectric light-weight models, versatile wear- and maintenance free technology which can be used for both cooling and heating. Or powerful and durable compressor models with excellent cooling performance and deep-freezing functionality. Contact Parts & Power for all your Caribbean marine refrigeration requirements.